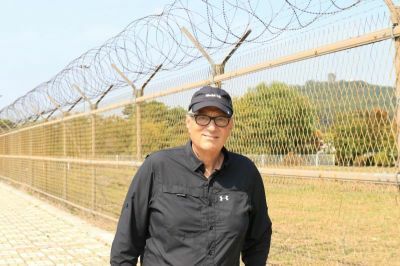 Vernon Brewer, founder and president of World Help, in Korea near the DMZ. America's conflict with North Korea is once again on the spotlight as President Trump visits Asia and meets with the region's leaders this week. In recent months, the tensions between North Korea and the United States have never been higher, leading many to fear the inevitable outcome could be war. But on the ground, alongside the North Korean border, I heard a different story. Just a few weeks ago, I traveled to the DMZ to interview North Korean Christian defectors who have been persecuted for their faith. I expected to hear stories of torture and imprisonment — and I did — but I wasn't expecting to hear the pleas of hundreds who want peace and for the two Koreas to be reunited. "The North Koreans are not our enemies," said a South Korean pastor who leads a church near the DMZ. "They are our brothers and sisters." I attended a prayer service where 200 South Korean Christians prayed fervently for peace and the reunification of the Korean people. This from the country that shares a border with North Korea and that is truly in immediate danger of North Korea's conventional and nuclear arsenal. If war were to erupt, the Pentagon estimates that South Korea would suffer the greatest loss, with as many as 20,000 casualties per day. The Christian defectors I met shared harrowing stories of persecution under the Kim regime. One woman sold herself as a slave to a Chinese man in order to escape North Korea; another man told me he attempted to flee four times, being arrested and tortured at several points, before successfully escaping the regime; and a third Christian explained how the government threatened his family after he defected. The suffering that believers experience in North Korea — which Open Doors has ranked for 16 years as the most oppressive country in the world for Christians — is beyond description. As many as 70,000 Christians languish in political prison camps, where they're tortured, raped and beaten to death. Yet, despite their suffering, North Korean Christian defectors want to help and share their faith with those still trapped inside. Some risk their lives to smuggle Bibles back into their homeland. As a humanitarian, my focus has been on helping the most vulnerable people on earth. From Latin America to Africa, the Middle East and South Asia, World Help has specialized in empowering impoverished communities and delivering immediate aid to conflict and disaster zones. But North Korea, the most secluded nation in the world, poses a unique challenge. We cannot simply barge in with the aid the North Korean people so desperately need. However, we've found we can still infiltrate the country with the Bible's message of hope and peace. Christianity is transforming North Korea in ways sanctions, international interventions and military threats haven't been able to accomplish. The Bible has managed to erode the lies of the Kim dynasty within the regime itself. This is why World Help has pledged to send 100,000 Bibles to North Korea by the end of this year. We want to help North Koreans find freedom and peace from the ideological darkness they live in. I am praying that peace will come to the people of North Korea. This past Sunday, Nov. 5, in observance of the International Day of Prayer for the Persecuted Church, Christians across the world joined in prayer for their brothers and sisters who are suffering persecution, discrimination and even death simply because of their faith. I joined my South Korean brothers and sisters in specific prayer for North Korea, that the North Korean people may experience faith and freedom, both physically and spiritually. In the face of conflict and war, Christians must always resolve to pray. Vernon Brewer is the founder and president of World Help, a Christian humanitarian organization committed to serving the physical and spiritual needs of people in impoverished communities around the world. Since its inception in 1991, World Help has delivered humanitarian aid to more than 79 million people in 70 countries.